We are dedicated to providing you with the latest, trendiest restaurants in town. We share first-hand dining experiences with you so you can share it with your friends. Great selection and variety of western food. Meat specialist indeed. Recommended. The balsamic vinegar is a very dark, concentrated, and intensely flavoured, the aged part makes it more wholly. The tomatoes and kale are fresh and tastes organic. The burrata, the main attraction did not fail to impress. Plentiful of fresh tuna for the fish-maniac. Great texture additions from the crispy tostadas and mixture of radish and tomatillo. Interesting choice in picking ponzu mayo that combines a savory and sweet and tangy flavour to the otherwise blander tuna. 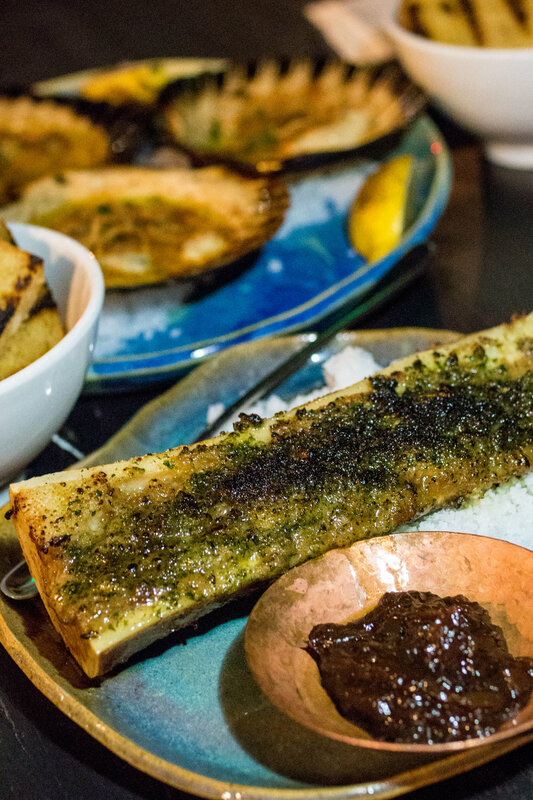 well-cooked bone marrow but lacking in a bit of meat flavouring, which was overshadowed by the strong parmesan parsley crumbs. The onions sauce was a slight good addition but did not help build up the original flavor. One of the best entertaining dishes here, with the obvious surprise of bacon featuring on top of the mussels. Mussels in general are often softer than clams so the crispy nature of the bacon. The cous cous (Couscous), a Maghrebi dish of small (about 3mm diameter) steamed balls of crushed durum wheat semolina adds to the great textures when you chew in your mouth, giving it a refreshing Italian flavor. I suspect that the chive oil and ‘nduja makes up the soup base, which gives it a stingy, fiery and slight-spicy taste to counter the more sea-tasting mussels. The scallops are cooked adequately without being too soft or too hard. Very smooth texture that lines up well with its counterparts in this dish. However, the extremely buttery scallops that cannot be offset by the crispy shallots and spring onions, which I find a bit disturbing just because of personal preference (I like a bit sea / salty taste to my seafood, weird, I know). Parfait is originally a French dessert that is made by boiling cream, egg, sugar and syrup to create a custard-like puree. And it literally means "perfect". However this one is both savoury and a hint of caramel. The combination has a faint reminder of foie gras which is definitely a delightful one. Use the toast as the vehicle in which the parfait is delivered into your mouth for a full, orgasmic experience. Roasted pork (like Hong Kong styled BBQ pork) put on the tradition taco of Mexico. Great use of herbs and onions with the special sauce (pesto?). is hard to photograph and this does not do it justice to be honest. The sparingly used garlic herb butter is enough to add extra, strong and spicy flavor that mellows and sweetens after sitting around the chicken for a while. 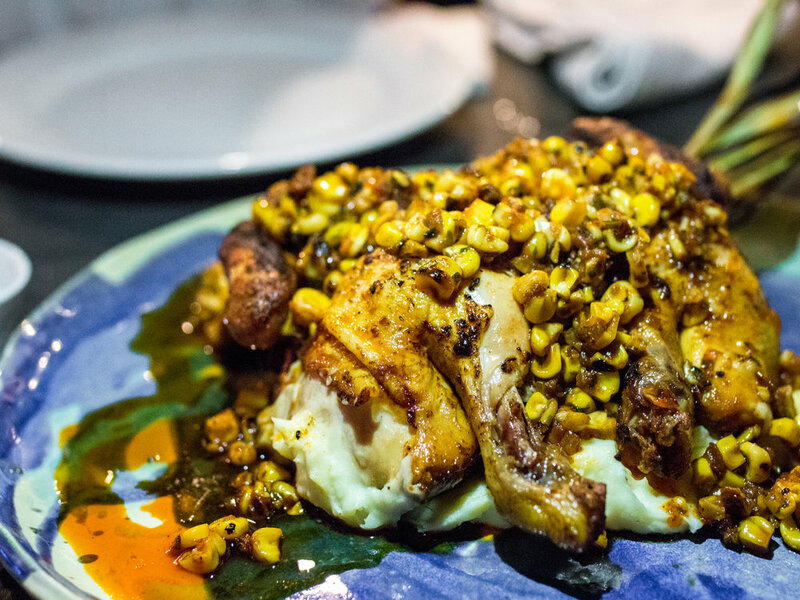 The potato puree adds contrast of textures (rough and non-volatile) to the smooth, mellow chicken meat. Medium rare is medium rare. Perfect cooking, as expected by a self-proclaimed meat specialist. T-bone is a good selection if you want to try different strips from the cow. Crosscut from the forward section of the short loin on a steer's middle-back, a T-bone steak contains a strip of the top loin and and chunk of the tenderloin, both desired cuts on their own. A T-shaped bone from the lumbar separates the two pieces. 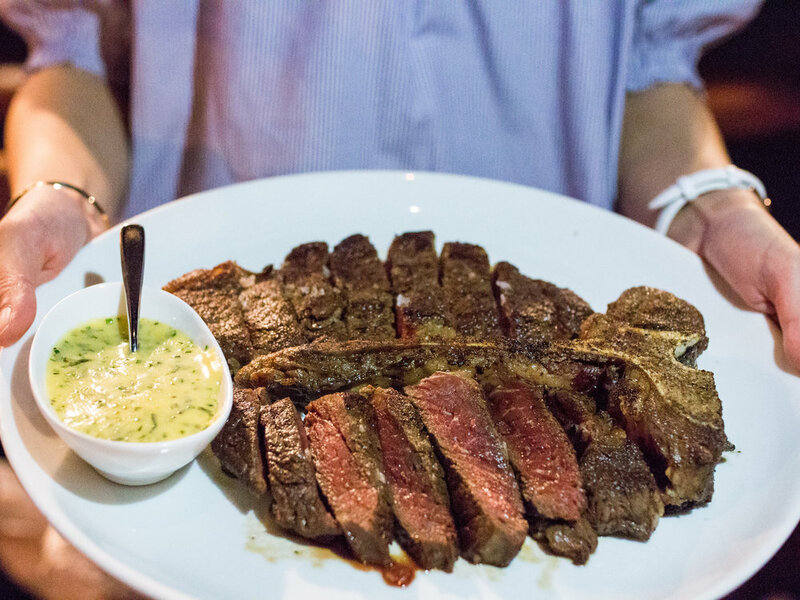 The tenderloin filet on the larger porterhouse cut -- essentially the same but for the size -- must be at least 1 1/4 inch at the widest point to qualify for the designation; the rules say a T-bone must have at least 1/2 inch. The T-bone combines the meaty flavor of a strip steak, often called a New York strip when it's sold on its own, with the signature tenderness of the filet mignon. The premium price reflects its position on the animal, coming from the area along the spine with the least used muscles. T-bones come cut at least 1-inch thick, though it's not unusual to find 1 1/2- to 2-inch-thick steaks. My favorite here, unfortunately, this is only a side. But do not let the size fool you, it has is cheesy enough to fill you up, so proceed with caution. 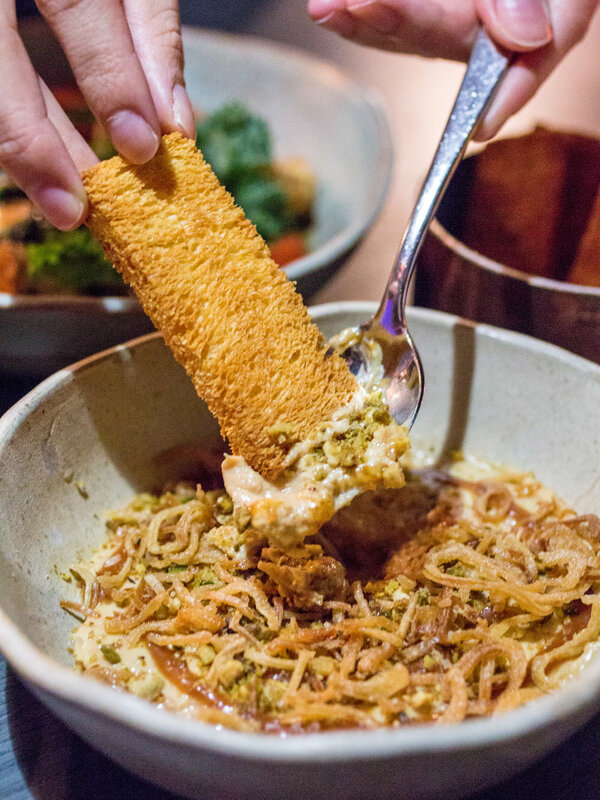 The macaroni are baked soft and chewy with an abundance strips of duck confit (slow-cooked) to give birth to this great side. Highly recommended. This is made huge because of the tasting requirements but it is definitely another highlight for me. The white chocolate butter makes it extra sweet as a huge bonus layer on top of the toast. 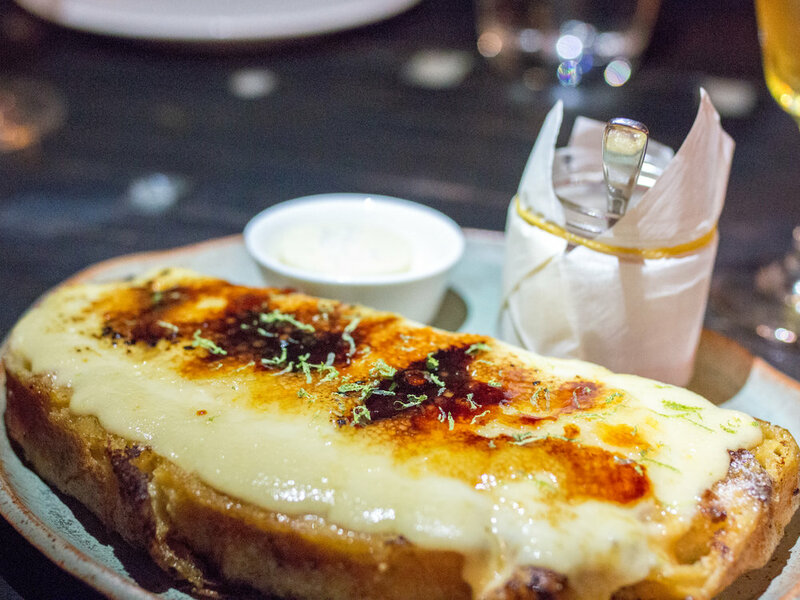 The middle of the toast itself is melted and soft partially thanks to the already, melted butter; with the slight crunchy crust this is a dessert made in heaven. Can do no wrong by ending the day with the red velvet cake. 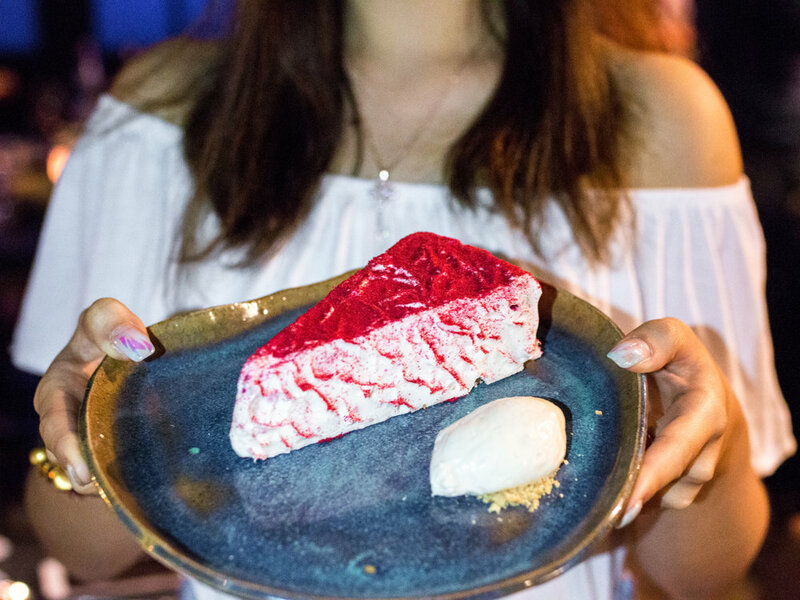 The raspberry dust and creme friche are great less-sweet contrasts to the cake; while the cake itself is not too sweet for my taste, especially having a great number of courses throughout the entire meal. This is a great place to bring your romantic partner for a romantic western dinner. The location is a bit far-off central but it is easy to find but is vibrant in the restaurant-filled scene in the area. I would recommend this place even though I am sponsored (thank you again for the invitation) and I am actually going again for my mum's birthday. Try more of their steaks and pork etc. I do believe they are justified to be meat-specialists. Drinks here are also special but I am no expert on that so I'll let you discover for yourselves. Hong Kong Foodie is all about providing value to you.